In 1916 Padraig Pearse and James Connolly, leaders of the Easter Rising, proclaimed an Irish republic from the steps of the GPO. In the ensuing siege, the republicans sheltered and fought from within the building. 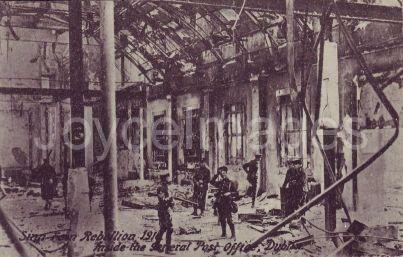 A fire broke out, destroying most of the interior, and the GPO remained closed for renovations until 1929.